Find yourself with some leftover champagne this New Year's day? This Champagne Yogurt Parfait is the perfect New Year's breakfast. The raspberry and cherry compote uses just a bit of champagne to give it a slight hint of a celebratory taste. In a medium saucepan on medium heat, add in the raspberries, cherries, champagne, and sugar. Simmer, stirring occasionally, for about 5-8 minutes, until the raspberries have broken down, and the cherries are softened. In the meantime, mix the arrowroot powder in the tablespoon of water until it is dissolved. When the compote is just about done, add the arrowroot slurry into the saucepan while stirring. Simmer for an additional 2 minutes, then remove from heat and allow to cool. You can transfer the compote into a bowl and place it in the refrigerator for it to cool faster. Spoon 1/4 cup of the yogurt (about 50 grams) into the bottom of a glass cup. Add on 2 spoonfuls of the champagne compote. Sprinkle on 1/4 cup of the granola. Repeat the process to make a second layer. Repeat for the remaining 3 servings. I paired this with a chocolate and nut granola. You can use your favorite granola, or if you need some granola ideas, you can try a Rye Bread Granola or Healthy Seed Granola. For a gluten-free recipe, use a gluten-free granola. 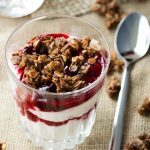 Get this recipe for New Year's Breakfast - Champagne Yogurt Parfaits at https://www.theworktop.com/breakfast-brunch-recipes/new-years-breakfast-champagne-parfait/.